Poetry slams are energetic performance poetry competitions where the emphasis is on the connection between the performer and the audience. Poems are judged on content, delivery, and originality, but that said, the points are not the point, the poetry is! When/Where/What is the London Poetry Slam? The slam consists of two rounds (1st round up to 12 poets, 2nd round half the number of poets will perform, or half minus one) and a feature performer. There is also an open mic at the beginning for up to 3 performers who would not like to be part of the competition. Five judges randomly selected from the audience will give scores out of 10 with the highest and lowest scores dropped, and the remaining three added together. Audience members are encouraged to be vocal, enthusiastic, and engaged. They’re also encouraged to try to influence the judges (who will remain consistent, we hope!) with applause or heckling, but all audience members are always required to show the love! The London Poetry Slam is an all ages event (Note that slams feature mature content & alcohol is served at our venue). If you’d like to perform, just show up! No pre-registration is necessary. Doors open at 7pm and sign up call is at 7:30. All are welcome to perform, just don’t be late! 2. Sign up for the main slam event if you would like to compete. This is open to 12 performers (see rules below). In the event that more than 12 poets sign up, performers names will be drawn randomly to choose the 12 competing poets (unchosen poets will get their name in the hat twice in the next month, and guaranteed a spot in the third month if they aren’t pulled twice). Please note that if you plan to slam, you should have 2 poems prepared in the event that you make it to the 2nd round. *0.5 points for every 10 seconds (or part thereof) over 3:10. Please respect other performers; if you know your poem is longer than 3:10 & you don’t care about the points, sign up for the open mic instead of the slam. ** Your assistive devices are not props! As long as they are not referenced in your poem or used in an obviously dramatic fashion, these do not break the rules. If you’re not sure, send us an email and we’d be happy to clarify. Want more info? Contact LPS Collective here! Slamming goes well beyond the London stage! Our slam season runs from June-March. 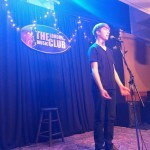 Competing poets at our monthly events gain points, and the Top 10 poets are invited to compete at our April Finals event. The winner of Finals is named our Grand Slam Champion & the top 5 poets are named to the London Poetry Slam team for the year. 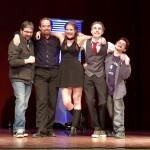 The team competes at the Canadian Festival of Spoken Word (CFSW), the annual national slam competition, against some of the best spoken word poets from across the country. CFSW is held in a different Canadian city every year. To see our current slam standings, click here. To see past London Poetry Slam teams, click here. Every April, one LPS poet represents our slam & city at the national individual poetry slam competition (Indies) in Vancouver BC! 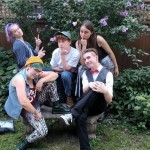 Voices of Today is a poetry festival run by youth for youth. Five days of workshops, open mics, and showcases, with the goal of bringing together youth poets from all across this colonial nation. Wondering where your $5 goes? The cover charge goes towards prizes for the top poets, remuneration for our feature poets, venue rental, etc. Running a slam is no cheap feat, but we try to keep our door charge accessible to everyone. We will never turn anyone away for lack of funds! 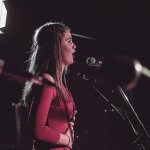 The London Poetry Slam is a local community arts event that is supported by artists, businesses, councils and individuals. Without the community’s full support the London Poetry Slam would not be able to reach as wide an audience that it does. … and all our monthly volunteers!